LONDON, England (CNN) -- A CNN.com journalist has achieved his goal of "tweeting" the London Marathon. A blurry Pete Wilkinson texts from his cellphone as he runs in Sunday's London Marathon. 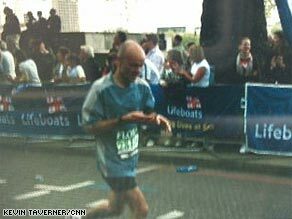 Peter Wilkinson, a digital news producer at CNN.com in London, updated his Twitter page during Sunday's race via text messages from his cellphone and completed the course in three hours, 30 minutes -- well inside his four-hour target time. "I've done it 3 hours 30 exactly," Wilkinson wrote as he crossed the finishing line. Wilkinson had been worried before the race that tapping messages into his phone and running at the same time would be "incredibly hard." But he completed the race mostly without mishap -- apart from risking damage to his phone by "tweeting" as he ran through a shower to cool off. "I don't feel too bad, it was a lot easier than I thought because I'm so used to texting," Wilkinson told CNN. "I didn't run into anyone." Wilkinson started the race with a friend who had guided him as he texted in the early stages. But Wilkinson left him behind after 10 miles. "I think the conditions were too hot for him," he said. Wilkinson said his spirits had been raised in the final miles by hearing a band playing a cover version of "A Forest" by the Cure, the music fan's favorite band. Prior to the event, Wilkinson had said he wasn't sure if his plan would work. "My main problem is going to be not crashing into other people," Wilkinson told CNN's Isha Sesay. "I don't think I'll have time to stop for too long." "Here we go! Walking to the start now. Greetings to all cnn viewers and readers," Wilkinson wrote in his first tweet of the day. Wilkinson said he was standing at the start next to runners dressed as the Sergeant Pepper-era Beatles. "Gonna be long winding road," he wrote. Wilkinson isn't the first marathon runner to tweet during the race -- a Google search turned up one runner who tweeted during last year's Boston Marathon and another who planned to do it during Sunday's race in London. Wilkinson was also running for charity and said any extra attention it brought to his cause "can't be a bad thing." The London Marathon starts in Greenwich, in the southeast of the city, and goes along the River Thames. It takes in a number of landmarks including the Tower of London, Parliament and Big Ben before ending at Buckingham Palace. More than 35,000 runners took part, according to marathon organizers. Race officials had advised Wilkinson not to tweet while running because of safety, concerned he might bump into other runners or trip over. The Flora London Marathon, as the race is officially known, takes place each April and is one of the top marathons in the world. All six male and female medallists from the marathon at the Beijing Olympics last year were running in the event along with celebrities including chef Gordon Ramsay and ITN correspondent Tim Ewart. In the men's race Olympic champion Samuel Wanjiru set a new course record as he ran to victory in two hours, five minutes and nine seconds. Defending champion Germany's Irina Mikitenko won the women's race in a time of two hours, 22 minutes and 11 seconds.